Recently developed four and five-layer coextruded tubing can help medical device manufacturers reduce costs up to 50%, while retaining, or even expanding, performance capabilities, says US-based medical tubing supplier Natvar, a Tekni-Plex company. It has developed the tubing as an alternative for those applications currently relying on expensive monolayer materials, as well as some two and three-layer structures. The technology also provides a more cost-effective alternative to expensive braided tubes for higher-pressure delivery systems, it says. “As medical device companies developed new products, increased their performance expectations, such as barrier, UV, bonding, and pursued cost cutting alternatives, it became obvious that traditional monolayers and some two and three-layer structures would not meet their objectives,” said Bob Donohue, general manager, Natvar. 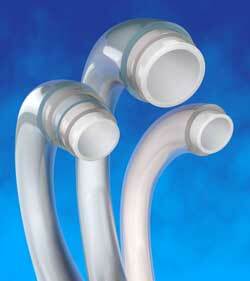 Key tubing attributes include flexibility, clarity and ability to be solvent and UV adhesive bondable. Additional desired characteristics could include UV protection and moisture/oxygen barrier. The objective was to develop technically-advanced multilayer coextrusions that would be more cost-effective than their predecessors. This is done by eliminating or minimising higher price per tonne polymers and substituting multiple, less expensive layers that would still deliver desired performance. Drugs that could benefit from this new technology are those that are delivered at higher pressures, such as contrast media. Traditional three-layer tubes with a polyethylene (PE) inner layer can adequately handle (based on application) up to 500 kg per sq in (psi). Drugs requiring pressures in excess of that (such as 1800 psi), typically require a braided tube, which is significantly more expensive. In addition to medications requiring higher psi for delivery, there are several other drug categories that could benefit from the higher multilayer technology. These could include highly corrosive drugs such as DMSO which need additional protection in the fluid path. The specific materials used in these four and five-layer structures are dependent on the application. However, an example is a PE inner layer for inert fluid path delivery/ethylene vinyl acetate (adhesive)/copolyester for barrier and burst strength)/EVA/polyvinyl chloride (outer). A colourant could be added to the middle copolyester layer, as well as a colour-coded stripe in the outer layer. Another structure type could include nylon for additional kink resistance and polyurethane for flexibility. Natvar has five manufacturing facilities in North and Central America, Europe and Asia.